Welcome by AGAIN today! 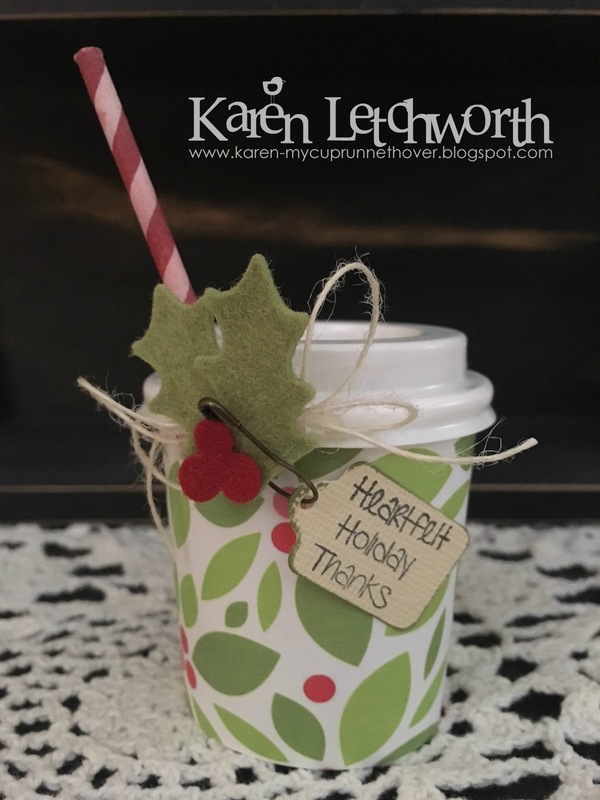 For this post, I'm sharing an adorable little coffee cup I created for the Winter Coffee Lovers Blog Hop and a sweet candy card I created for the Visions of Sugarplums Challenge. The coffee cup was something I found at a Scrapbook store in Loveland, Colorado while I was visiting my daughter on my recent trip. They sold these adorable tiny coffee cups with plastic lids for just fifty cents, and the "wraps" for them were....well, let's just say TERRIBLY overpriced! Anyway, I used the expensive wrap to cover my cup, and then I tucked a paper straw in it, and added a tiny tag stamped with a retired Paper Sweeties sentiment hanging from a rusty safety pin, and topped it with wool felt holly and berries using a Papertrey Ink die-cut set. The final touch was some Ivory Burlap String that I tucked in behind the holly and berries. 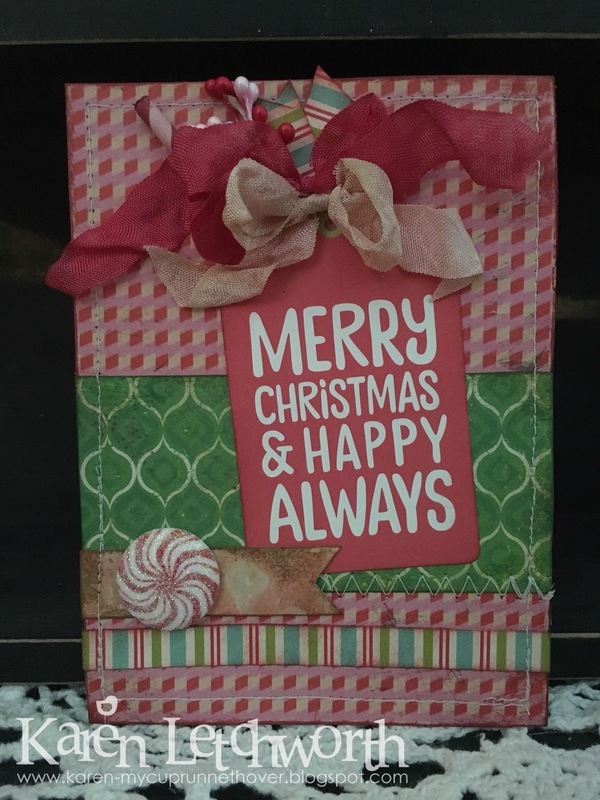 My card was created using some Crate Paper patterned papers and a simple Christmas tag I had picked up in a random package. I machine stitched all the patterned papers and inked them as well. On top of the tag, I added some Flower Stamens, Seam Binding, and a striped paper straw. 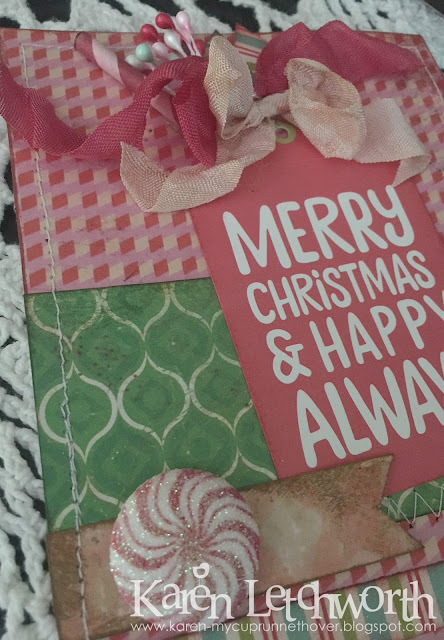 Visions of Sugarplums Challenge - I thought this candy card was PERFECT for this extra SWEET challenge. Lovely little coffee cup and card! A perfect gift for someone! Fantastic cup so well decorated and I also love the wonderful card you made. You do such pretty designs always! I am always inspired. Love how you pinned the tag with the safety pin. Such a pretty altered mini coffee cup and your card is beautiful! wonderful coffee cup love the directions you used. beautiful card. Wow! Another stunner! And that adorable coffee cup! Pretty in Traditional colors with great mixing of papers! My oh my, sooo sweet! Very festive. I like the use of wool felt.